It's week 11 of Meatless Monday! Yay! Today Kidlet gets a TARDIS sandwich thanks to an amazing cookie cutter we got from a bento buddy! Today also marks my Bloggaversary! 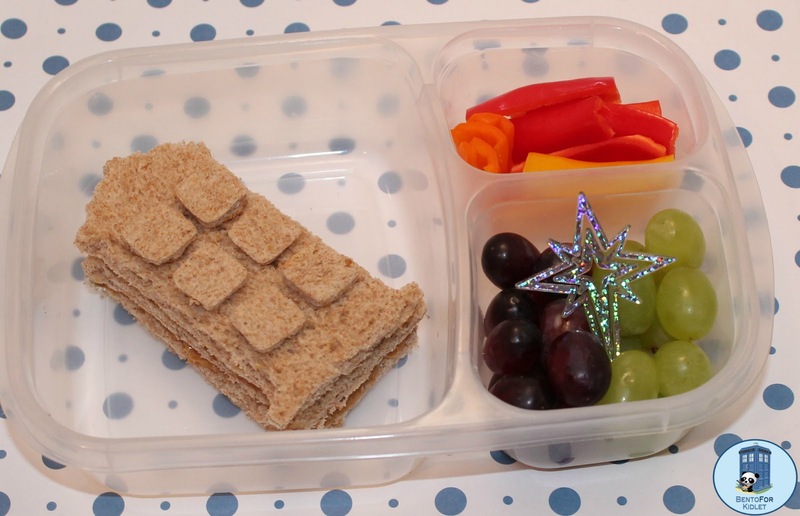 I have been blogging on BentoForKidlet for 5 years today! Woo! Thanks to everyone who has come along for a ride :) It's been a fantastic 5 years! (¸.•´ (¸.•` ¤ Happy 5th Bloggiversary!!! Happy Blog-aversary!! Congrats and here's to 5 more great years!! Happy bloggerversary! (However you spell that) Love the TARDIS! Congrats on 5 years! Awesome! And love that TARDIS!